After a long hiatus, it's time to get back to the garden. I planted a legume-based cover crop in the 2 lower gardens last fall. They grew to be 2-3' tall. 1 month ago we dug it in. I still have to break up some big lumps in the soil, but it's time to start planting. I'm only going to use the 2 big gardens on the bottom this year. No hillside gardens. I would have started earlier, but I spent 6 days in San Miguel de Allende recently, and I didn't want to be gone at such an important time. When you've just planted the seeds, you have to watch over them carefully, like a newborn baby. Anyway, I'm ready to roll. Yesterday, I prepared small containers to start seedlings, which would later be transplanted into the main gardens. 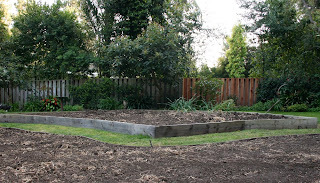 I planted cucumbers, watermelon, eggplant, broccoli, red, yellow and purple bell peppers, Jalapeno peppers, Brandywine tomatoes, Beefsteak tomatoes and Chianti Rose tomatoes. I also planted zucchini, Butternut squash and summer squash. Some of the other vegetables, I will plant directly into the main gardens, like the radishes, beets, onions, carrots--all the root vegetables. Have to buy some more potting soil. I want to start the peas and beans as soon as possible.